& Start Getting In Touch With 100 of Your Prospects & Customers Every Time!" 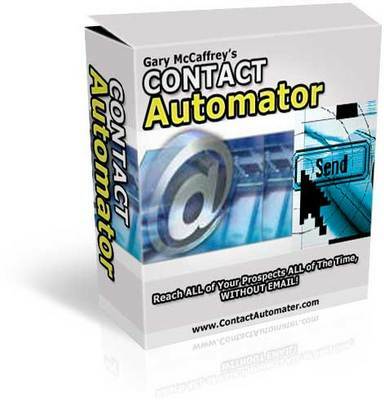 You're probably wondering exactly what 'Contact Automator' is. Well... its a revolutionary new program that allows you to create little applications that sit in your prospects system tray (The bottom right of your screen beside the time). This application will check whatever URL you tell it to as often as you want. And every time the URL updates, it lets your prospects know! Newsletters - Guaranteed delivery of every issue of your newsletter -- no more accidental filtering or blocking of the e-mail version by ISPs and filtering software! Special Offer Alerts - Your prospects get instant notification of all your latest special offers! Backend Promoter - Strike up affiliate partnerships and promote them through 'Contact Automator'. Affiliate Updater/Motivator - Inform your affiliate's of your new promotional material and products. Keep them up to date with their affiliate stats and motivate them to make YOU more money! Membership Site's - Run your membership site through 'Contact Automator', now your members will always know as soon as you add new content. Product Updates - Inform your customers of the latest updates to your products so they can get instant access without even opening their browser or email program! Download Area - Have your website download area contained within 'Contact Automator' so you can bring people back to your offers long after they download your freebies!